MasterBooter is a software that has been designed by Daniel Nagy. This is a multi boot tool that can be used to install and maintain many operating systems. Booting: The software can boot from any hard disk partition. Once installed, he can first save a copy of the partition tables by clicking on the MRESCUE button, because once it has been modified, it can be used anymore. Scheduling: MasterBooter also allows the user to schedule the process. All he has to do is to define the time and date and the software will take charge of the rest. It works automatically. Customization: This utilitarian enables the user to configure the boot parameters according to his preferences or change the interface's color. He can also rename each partition. Once done, he can save it for future use. MasterBooter offers an online documentation help that is translated in different languages and downloadable for free. 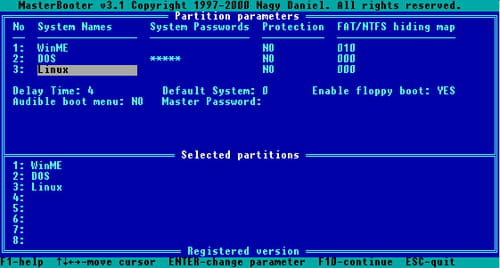 The user can create a master password to protect partitions and configured parameters. It has an optional floppy boot support. Latest update on July 30, 2015 at 08:04 AM.